I had not forgotten the interesting fungus in the swamp, no indeed. 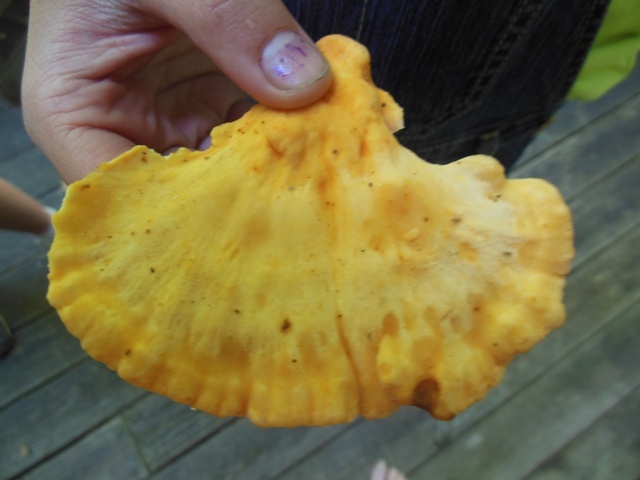 Anything that might be an edible mushroom called Chicken in the Woods is certain to remain on my radar. But how to get close enough to it to identify it and harvest it? I went looking for an experienced guide. My neighbor Tommy is fleet as a deer. He can leap from hummock to hummock without getting wet. He also possesses a very good sense of direction and an intrepid friend named Annabell. Perfect. Off we went into the depths of mystery. Tommy made his way to the other side of the tree and removed a sample. He said there was a lot more fungus where that came from. We re-splashed our steps and went back to the Writing Studio and Bait Shop to examine our treasure. We made pictures of both sides and wrote up our notes. 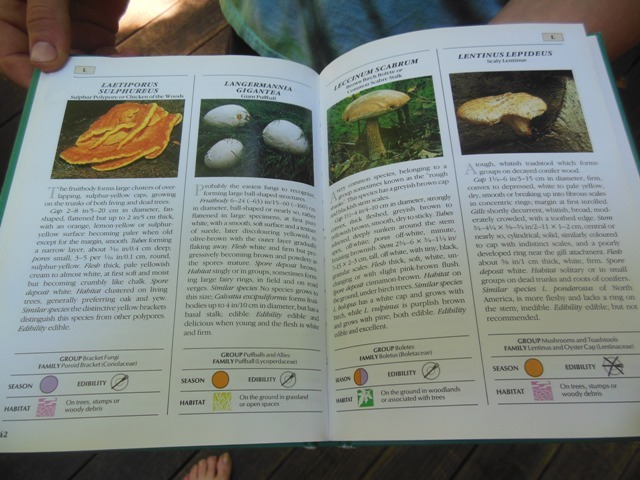 My guides went off to find a good mushroom book. They think we may have a winner. They agreed to consult with parents more knowledgeable than I. My job was to bathe the Cowboy and dry him out. Both of us survived the experience. If we decide to cook some Chicken in the Woods I’ll let you know how it turns out. Thank you for helping to make our summer more fun! See you soon. We aim to please. Thank you for lending us Tommy. Let us know how it was … love this post ! Thank you, Sybil. I had a lot of fun splashing around. Always (well…almost always) fun to splash around in a swamp. Unless you are a sheltie-girl I suppose. 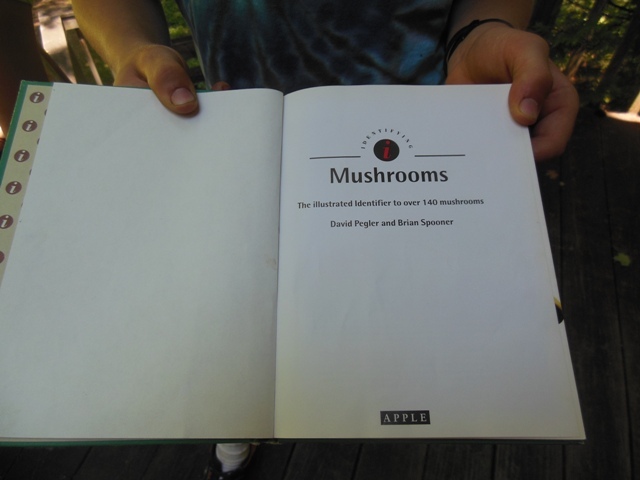 Let us know how the mushroom experiment turns out! I wonder if it tastes like chicken noodle soup. Hurry up and eat it. We need to know! I have a suspicion we are going to be disappointed. Is it not too beautiful to cook? No. I like pretty food. It looks like chicken in the woods to me but what do I know. Take care! You know quite a lot. I will definitely take care. That is chicken of the woods, but it’s old. Would be tough. Sigh….. It does taste like chicken when it’s new and fresh. Story of my life. At least I know where to find it next year. And I’m going to go back into the swamp to see if there’s a newer patch. I was going to say that it looks like it has a little age on it, whatever it is. That made me think it might be time to go have a look in the mirror, but I feared I might look more mushroomy than I’d like. To be frank, i’m not one who’d be right eager to eat some of that thing. It’s a mushroom thing. I do all right with some varieties, but those mushroom sandwiches aren’t for me, either. Clearly, my palate could use some sophisticating. 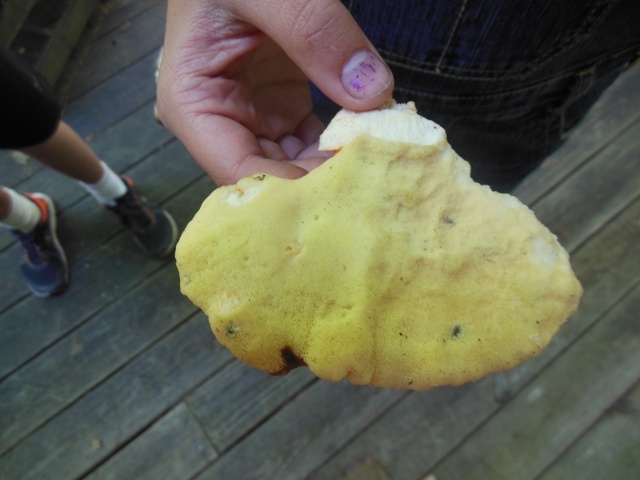 I was fascinated by mushrooms when I was a little girl, but my mother looked at them askance. “Toadstools!” she pronounced, and warned that they were poisonous and would kill me. When I grew up I decided that I really liked mushrooms and bought them at the grocery store. One of my favorite dishes was stuffed portabella caps. Perhaps part of the delight was a hidden suspicion that they were potentially fatal. What do you want to bet that “Chicken in the Woods” tastes like chicken? If you do end up eating it, you are more intrepid than I. Sometimes even chicken doesn’t taste like chicken. I remember being told that rattlesnake tasted just like chicken. Not true. just now read this post and I love the pictures and the story. I thought for a minute you might see a hobbit jump out or something. I, too, love mushrooms but am a little nervous about eating wild ones without someone more knowledgable to tell me they are OK. I still have fond memories of a mushroom pasta I had once years ago – makes my mouth water to think of it. It was an adventure reading your post! I am positive that we have not begun to plumb the secrets of the swamp. I’m glad you enjoyed the post. In the event we concluded that it was past its prime and did not eat it, so I did not love it in that sense. On the other hand, I was enchanted with the ruffles and flourishes of mushrooms in the swamp, and will go back again this spring.